Top Notch Material: Get ready for Christmas with Smithsonian Young Explorers from Silver Dolphin! Win Your Set of 4! Get ready for Christmas with Smithsonian Young Explorers from Silver Dolphin! Win Your Set of 4! As you know, my oldest in dinosaur obsessed, but what you may not know is he was also obsessed with puzzles a few years ago. His interest has somewhat lessened in them this year, but he still loves working on them, especially if I help! Silver Dolphin book must be inside of his mind, because they created a product that combines his two loves: dinosaurs and puzzles and even throws a poster in for good measure! Get ready to go back in time with the Smithsonian—and experience life among the dinosaurs. Smithsonian Young Explorers: Dinosaurs provides the perfect introduction for kids 6 and up to the fascinating world of dinosaurs. The playful and informative fact book teaches kids how we learn about dinosaurs, how they are classified, and which dinosaurs ruled the land millions of years ago. Read about the mighty T. rex and the chicken-sized Compsognathus. Learn how scientists solved the mystery of the plates of the Stegosaurus. And find out which animals descended from dinosaurs surround us today. Once young explorers have become paleontologists-in-training, they can continue their education by assembling the included dinosaur floor puzzle. The colorful puzzle and poster give kids extra opportunities to learn about the different dinosaurs and engage them in the sciences. And once kids are ready to go on the hunt for their own dinosaur bones, the book, puzzle, and map all tuck neatly into a snap-shut suitcase, ready to uncover the new greatest dinosaur that ever lived. While my son knows all the facts listed on this puzzle (he is something of a dinosaur expert at the ripe old age of seven) he loves looking at the pictures and talking about each dinosaur with me. He also gets a thrill out of educating me on dinosaur facts I never knew and we love the bonding time that we share while working on this puzzle together. I love that the case that carries this puzzle snaps shut so it is easy to keep together, and look neat and tidy! Get ready to go under the sea with the Smithsonian—and experience life beneath the waves. Smithsonian Young Explorers: Oceans provides the perfect introduction for kids 6 and up to our undiscovered underwater world. 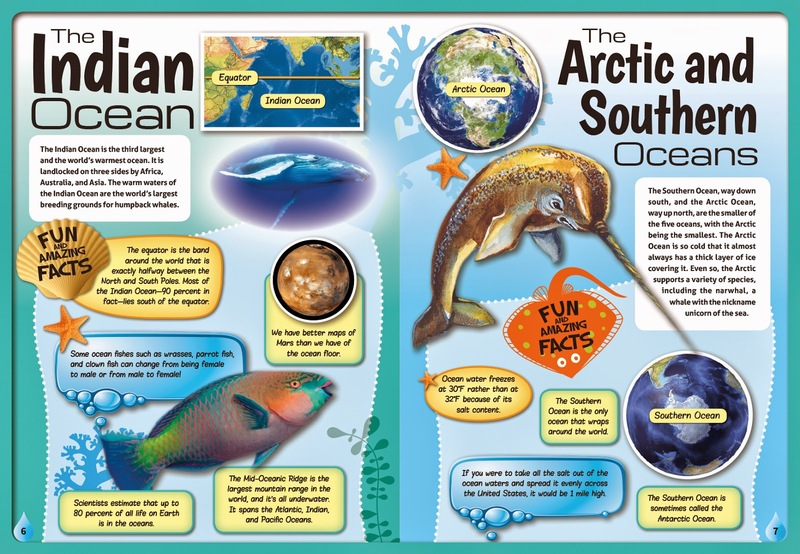 The lively and fun fact book covers the science of ocean movement, pollution, and fascinating facts on marine life. From profiles on the Pacific, to waves and tsunamis, kids will love to learn about the basics of the ocean. And of course, all the cutest sea creatures (sea otters and dolphins!) and the fiercest (great white sharks and poisonous jellyfish!) and all their ocean friends are covered in detail for young ocean explorers. Once young explorers get their feet wet in the world’s oceans, they can continue their education by assembling the included floor puzzle of colorful marine life. The puzzle and poster give kids extra opportunities to learn about the ocean and engage them in the sciences. And once kids are ready to dive in headfirst, the book, puzzle, and map all tuck neatly into a snap-shut suitcase, ready to embark on a journey on the high seas. 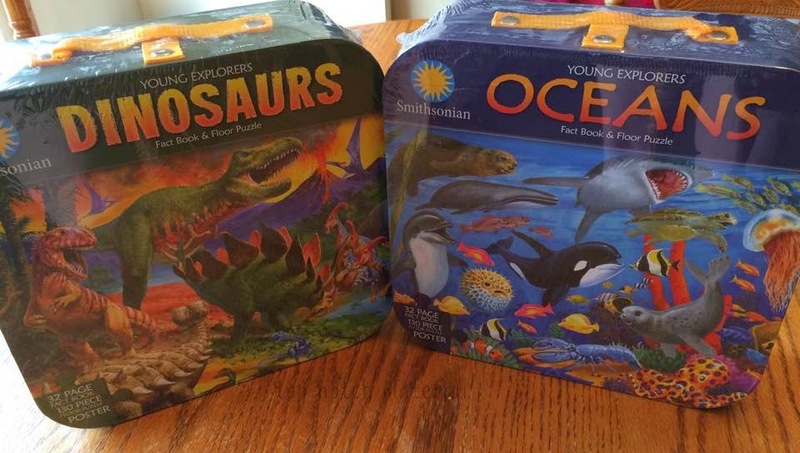 My little smartie is not an expert on the ocean and creature of the ocean so we both learned a few interesting facts with this puzzle and poster set! Once again, we had an absolute blast putting this together and talking about all the whales and dolphins we saw! At $18.95, I feel like this makes an awesome Christmas gift if you have a very science minded little one in your life (like I do!) If science is not your little ones thing, Silver Dolphin books carries all kinds of titles for all ages! You could definitely spend some time browsing all of the awesome gift available! We were also lucky enough to get a couple awesome books from Silver Dolphin as well. These titles, Discover: Flight and Discover: Space are so educational! 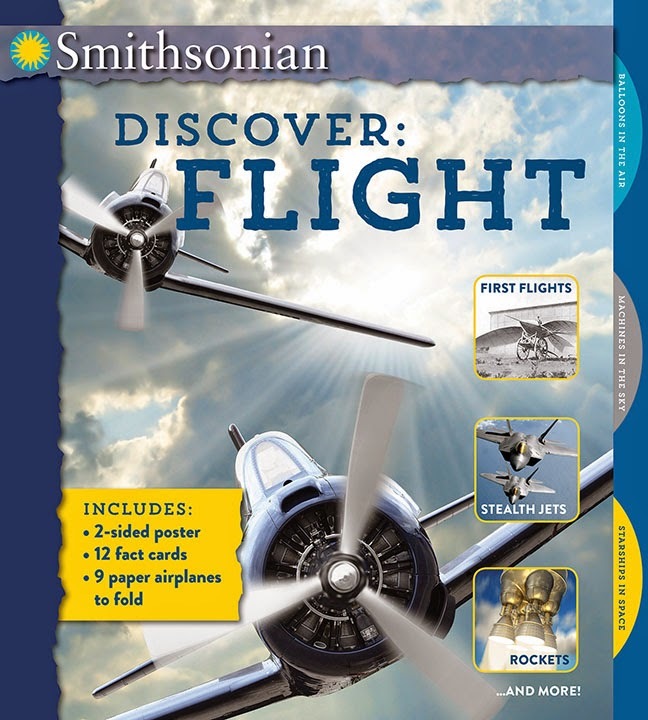 Smithsonian Discover: Flight brings the awe-inspiring experience of the Smithsonian’s National Air and Space Museum right into the pages of a book. 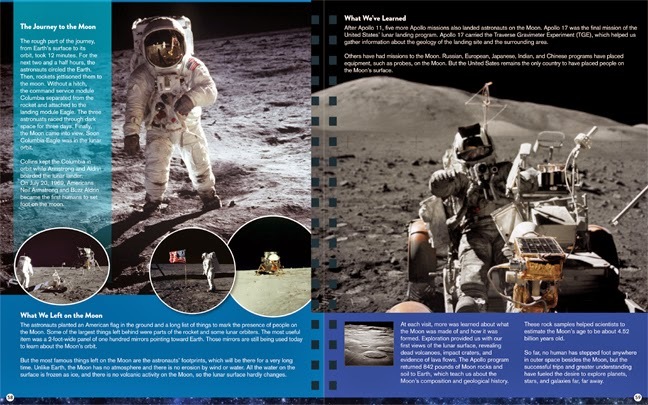 This authoritative guide to the history and science of flight answers all the questions that kids will ask (and that parents may not be able to answer), like “What makes a plane stay in the air?” “What’s a sonic boom?” and “How do astronauts go to the bathroom in space?” Arranged into three sections, Balloons in the Air, Machines in the Sky, and Starships in Space, Smithsonian Discover: Flight chronicles the history and evolution of flight in way meant to inspire future aviators and astronauts. This unique title also delivers hands-on activities like you would find at the Smithsonian. Bound right into the book are 12 fact cards on the coolest aircraft, a large double-sided poster, and 9 paper airplanes in three designs (a historic glider, a military jet, and a space shuttle) with easy-to-follow folding instructions. Altogether, Smithsonian Discover: Flight offers kids a chance to take off on a trip to the Smithsonian without ever leaving their seats. Smithsonian Discover: Space take a spectacular journey into the farthest reaches of space with the Smithsonian. This engaging and informative guide to the galaxy, the planets, and the universe brings the incredible experience of a visit to the Smithsonian’s National Air and Space Museum into the pages of a fun and fantastic book. Smithsonian Discover: Space is organized as a virtual trip through outer space, starting at the edges of the expanding universe, continuing into the spiral Milky Way galaxy, then arriving in our solar system to explore each planet in turn. Both of these books are absolutely fascinating to me! I have learned so much stuff that I have forgotten over time. We have made it a nightly routine to read these books together and talk about the information that we have learned and use our imagination, and thinking about what it might be like to space travel and walk on the moon! If you have a little one that likes to learn, or has a big imagination, I highly recommend these titles from Silver Dolphin. At only $16.95, they are an affordable stocking stuffer! Win It: One lucky winner will receive all 4 titles listed above. Hello! Thanks for the chance! I would love to have the Scientriffic Planet Earth book. Looks really cool! I'd love to have the Slide and Discover: Dinosaur Atlas, too! I would like the Scientriffic: Planet Earth book. I think my grandsons would really enjoy it. I'd love Scientriffic: Planet Earth! The pretend and play toolbox! My son would love this. My daughter would love Smithsonian Discover: Flight as she wants to be an astronaut when she grows up. I'd also love the Dinosaur World book for my son! I would love to have the rudolph the red noised reindeer pop up book. I'd like to have The Comic Book Bible. Thanks. Oh I would love THe Planet Earth book but I could also go for the THe COmic Book Bible! SO hard to choose because they have so many great ones! I would choose the three dimensional model of Planet Earth. I would like the Slide and Discover: Dinosaur Atlas book for my daughter. My grandbebe boy would love the Slide and Discover: Dinosaur Atlas! Thanks for the chance to win! I like this item - Smithsonian Young Explorers: Oceans . I really like the Rudolph the Red-Nosed Reindeer Pop-Up Book. I would also love to have the Rudolph the Red Nosed Reindeer Pop Up book! I love the classic version of Rudolph and that would be such a cute book for my daughter and I to enjoy every Christmas!